Darryn’s in the Wizard from Oz BIG Brother turned into the Wizard of Oz yesterday when the housemates were forced to dress as characters from the classic movie for their shopping task. The three housemates facing eviction – Bobby, Kerry and Sally – all became Dorothy and got to choose the roles for the other housemates. 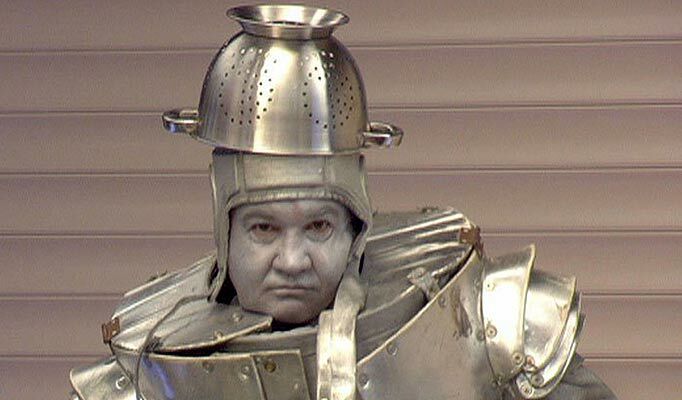 They picked Darryn as the Tin Man, Paddy as Dorothy’s dog Toto, Pamela as the cowardly Lion, Lucien as the Wicked Witch and Amy as the brainless Scarecrow. 10 Most Iconic Images in Film History Depicting a firm sense of friendship despite both physical and emotional differences, this is one of a number of lasting images from a well-loved and iconic film. Judy Garland’s youthful effervescence is radiant and perfectly captures the spirit of the films narrative. The supporting cast help cement the unity of the group and their happy expressions again confirm the generally cheery disposition of the film. Today, The Wizard of Oz remains as popular as it was upon its release, with all manner of merchandise still readily available. In fact, this image alone can be found on anything from a greetings card to a lunch box, via a 3D poster! What remains certain is that this particular still will remain within popular culture for many years to come. 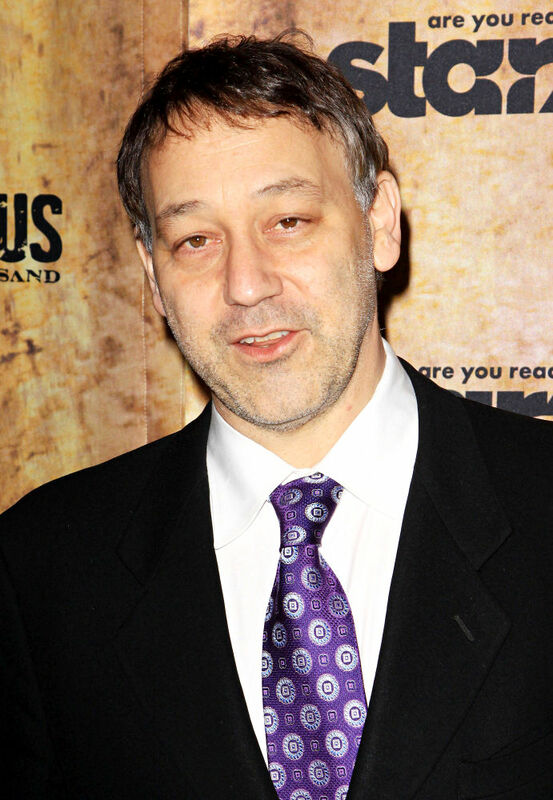 Sneak Peek of Sam Raimi’s ‘Oz: The Great and Powerful’ Shared at D23 Raimi opened the video and explained that the film will focus on the origin of the wizard and who he was beforehand. “Oz is almost part of our DNA, this fantastic take on our own world where our dreams can come true, where we can become the people we long to be,” he said. “But also there are dangers along the yellow bring road.” “When we first meet Oz, he’s a carnival showman, a magician,” the helmer, best known for his work on three “Spider-Man” films starring Tobey Maguire, said about Franco’s character. “Though he has a good heart, it’s gotten lost somewhere along the way.” Franco, meanwhile, described his character as “a bit of a con, a bit of a Lothario and a seducer. When he gets to Oz, it’s a chance to redeem himself.” Concept images of the emerald city, munchkins, people travelling Oz via giant bubbles, the yellow brick road, as well as a small girl made entirely of porcelain were additionally displayed. Disney and Raimi Preview New Oz Disney pulled back the curtain at D23 Saturday to reveal Oz The Great and Powerful, a prequel to Wizard of Oz that just recently began filming in Michigan. Although neither director Sam Raimi nor his cast — which includes James Franco as the title character — could make it there, the filmmaker did send along an EPK-style sizzle reel featurette to take D23 attendees behind the scenes of his new movie. The featurette showcased concept art of Raimi’s Oz, which the filmmaker insists is closer to author L. Frank Baum’s original description of the fantasy land than past film incarnations have been. If you can imagine a realm somewhere between Tim Burton’s Wonderland, Avatar’s Pandora and the Irish countryside, you have a good idea of what’s in store. Wizard of OZ is 72yrs old today! It’s 12:40 am Friday morning and NYC’s Madame Tussauds decides they need an over sized pair of the world famous Wizard of Oz’s Ruby Red Slippers in order to celebrate the launch of The Wizard of Oz Cinema 4-D experience in New York that coming Tuesday. Interested in seeing photos of how we made them? Check out our Facebook fan page and don’t forget to hit “LIKE” !!! “The Wizard of Oz: Classic Movies on the Radio” Audiobook Download Now Available The digital audiobook The Wizard of Oz: Classic Movies on the Radio, narrated by Judy Garland, has received an average rating of 4.09 stars on Audible.com. The title has a running length of 1 hour The audiobook was first released in December 2006 and a sample is available for download. The audiobook is normally sold by Audible.com for $2.95, but if you’re not already an AudibleListener® member, you can take advantage of a special promotion and get The Wizard of Oz: Classic Movies on the Radio or any other audiobook for free with a 14-day free trial. If you are a current Audible.com member, the audiobook is available for 1 credit(s). Art review: The striking comic artistry of Ben Caldwell Caldwell, in all of his skills, is a cartoonist and animation developer who utilizes every resource at his command in order to convey a strong, visually compelling narrative in cartoon form. He is an obsessive and consummate draftsman, who during the course of our conversation was drawing into a small tablet all the while. Well versed in the history of comics, he is familiar with those of the past and is the illustrator of such graphic novels as the vampire saga of Dracula, the Wizard of Oz, Harry Potter and the further adventures of Wonder Woman. This exhibit displays many first-draft ideas and is filled with examples of his work, from minor sketches to completed, full-color pages of exacting precision. Presently, his style echoes a combination of wistful Disney-esque wide-eyed characters, sweeping perspectives and an energetic manga sense of leaping action. He uses a clean, clear and crisp calligraphic line that never appears disjointed or awkward regardless of the fantastical subject matter. Geckos on display in Gulfport The theme of the 2011 Gecko Ball is The Lizard of Oz. Oz-inspired décor will take over the entire Peninsula Inn. Admission includes an Oz-inspired dinner buffet, live music and dancing featuring Kevin Wilder and his Yellow Brick Roadies, a photo booth with Oz backdrops, cash bar and drink specials including Geckotinis and Ruby Slippers, silent auctions and other surprises. Costumes are encouraged, but are not mandatory. Judy Garland Drama Coming to Broadway “End of the Rainbow,” Peter Quilter’s popular London drama-with-music about the final months of Judy Garland’s life, will come to Broadway next year, the show’s producers announced on Thursday. Performances are scheduled to begin March 19, 2012, at a Shubert theater to be announced, with opening night set for April 3. Tracie Bennett, a two-time Olivier Award winner who originated the role of Garland in London, will reprise her role on Broadway. Judy Garland in 1944 film “Meet Me in St. Louis” on Blu-ray December Warner is bringing the classic 1944 musical “Meet Me in St. Louis” starring the late Judy Garland to Blu-ray Disc on December 13th. Tech specs for the release have not yet been officially detailed but stay tuned. The title is now available for PRE-ORDER over at Amazon with a $24.99 price tag. The release will come in the form of a “DigiBook” and the bonus materials set to be included are listed below. Even further below after the break you’ll find a trailer for the film. Introduction by Liza Minnelli. Audio commentary by Garland biographer John Fricke, actress Margaret O’Brien, screenwriter Irving Brecher, songwriter Hugh Martin, and Barbara Freed-Saltzman, daughter of producer Arthur Freed. 3 documentary specials – Meet Me in St. Louis: The Making of an American Classic, Hollywood: The Dream Factory, and Becoming Attractions: Judy Garland. The 1966 pilot for the Meet Me in St. Louis TV series. 2 vintage shorts – 1930′s Bubbles and 1941′s Skip to My Lou. Audio Vault featuring an outtake of “Boys and Girls Like You and Me” and a 1946 Lux Radio Theater broadcast. International Wizard of Oz Club convention takes fans over the rainbow Well over 300 members came to skip down the yellow road on Saturday, and it was apparent just how excited each person was. The unique part of the day’s events was that those that had worked at Oz when it was in operation came to perform songs and skits that had been a part of the park’s daily program, and also shared their memories and photos. 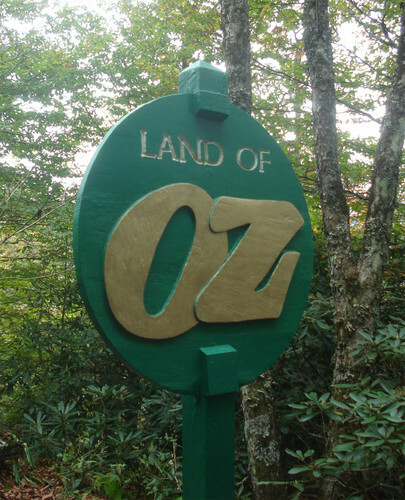 The fact that the Land of Oz is not open for tours, except for the first weekend of October during its Autumn at Oz festivities, made the day all the more special. Off to hear the Wizard Acclaimed classical guitarist Chequerboard (aka John Lambert) will perform a specially commissioned soundtrack to the 10-minute silent film The Wonderful Wizard of Oz (1910) before the main screening, which is part of the Kilmainham Arts Festival, which takes place on August 26th and 27th. 30th Annual Wizard of Oz Fest in Chesterton will not include ‘Lollipop’ Munchkin This year, I’ve been told by festival publicity go-to gal Mary Reinhart that this year, her committee has officially secured attendance by two of the four surviving original Munchkins from the movie: Karl Slover and Magaret Pellegrini. At the age of 21 and standing just 4 feet 4 inches, Slover, who turns 93 on Sept. 21, can be seen playing the first trumpeter in Munchkinland. Pellegrini, who turns 88 on Sept. 23, is in good spirits, but has been fighting some health ups and downs this month. On July 31, she had surgery to have a pacemaker implant for her heart. Pellegini, who was just about 16 at the time of filming, is seen in “The Wizard of Oz” playing one of the “Sleepyheads” in the Munchkinland over-sized nest. This year’s festival, which is Sept. 16-18, will also include appearances by Mary Ellen St. Aubin and Myrna Swensen, who are considered “Munchkins by marriage,” since their late spouses had roles in the film. 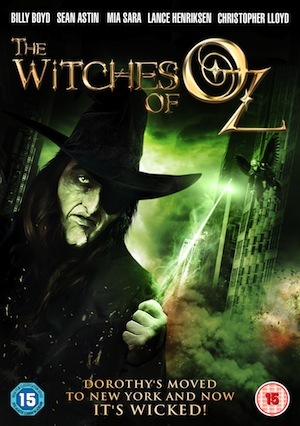 DVD Releases: ‘The Witches of Oz’ While the idea behind it – to imagine Dorothy as the writer of the adventures herself – is a fascinating one that can ideally lead to an interesting reworking of the story, the way this TV series has been crafted just flattens out any initial interest the plot outline may have sparked. In fact, the idea might as well be the only good thing about this production. Even if you’re willing to look past the uninspired and at times ridiculous costumes and make-up – which make Dorothy Gale look like the personification of a weird and slightly irritating cartoon character, for instance – the actors’ performances also continuously shift from bland to unnecessarily and childishly over-the-top. Walt Disney Studios Announces Movie Line-Up for the D23 Expo! Exclusively at Disney’s D23 Expo August 19-21 at the Anaheim Convention Center, Disney film fans will go behind the scenes to explore the exciting roster of projects on the horizon at The Walt Disney Studios, with a variety of panel discussions, sneak peeks, and exhibits. On Saturday, August 20, Rich Ross, chairman, The Walt Disney Studios; Sean Bailey, president, Production, The Walt Disney Studios; John Lasseter, chief creative officer, Walt Disney and Pixar Animation Studios; and Kevin Feige, producer and president, Marvel Studios, will present a not-to-be-missed look at The Walt Disney Studios’ upcoming film slate, which includes Disney’s The Muppets, John Carter, Disney-Pixar’s Brave, Marvel’s The Avengers, Tim Burton’s Frankenweenie, Oz: The Great and Powerful, and more. Jersey Jack Pinball’s Wizard of Oz Video The video was shot using an early whitewood without any of the major toys in the game, but it illustrates where the key shots are, where they feed and how the mini-playfields are accessed. The music used in the video is from the game, but it won’t be used throughout gameplay in the same way you hear it here. Indeed, much of it is only played before you launch the ball with other themes taking over once the ball is in play and features begin. Nightranger: Wizard of Oz Night at Mr. Black Somewhere over the rainbow (and over Avalon Hollywood), Mr. Black at Bardot transformed into Emerald City to celebrate the birthday of The Weekly’s own Lina Lecaro (Glinda) and party girl Cassie Carpenter (Dorothy). The wicked Wizard of Oz-themed bash also saw lions, tin men (and wo-men) and even some ruby strippers. Yes, there really is no place Hollywood. ‘Oz’ offers glimpse at the beginnings of the wizard “One of the reasons for making this kind of film now is that the technology available allows worlds like Oz to really be created in both fantastical splendor, but also in ways that it can take the viewer’s imagination to that place, and you can really be engulfed in that world,” leading actor James Franco said. In Defense of the Medium: My Neighbor, Skottie Young Skottie Young lives ten minutes away from the town in which I grew up. Allow me to amend that: recently-named Eisner winner Skottie Young lives in the Illinois town that’s home to my high school’s arch rival football team. Think Friday Night Lights, only with cornfields instead of cattle ranches, and you’ve got an idea about how I view this place. It hurts me to say nice things about it. Normally, having a comic artist living near you might not be anything to make a fuss about. But both towns are what I like to think of as suburbs of the suburbs of Chicago, small enough that the high schools drew from “feeder” junior highs — needless to say, not too often does something exciting happen. ‘The Wizard Of Oz’ Is Facebook’s Most Explosive Page This week’s fastest growing pages include many surprises, such as the number one ranking of The Wizard Of Oz page. Read on for more, and if you like what you see here, don’t forget to look over our detailed statistic tool used to build these rankings! Wizard of Oz pinball playfield coming together nicely The Wizard of Oz Pinball tease continues but the latest update shows some significant additions to the machine, with some toys to be found on the left side of the playfield. 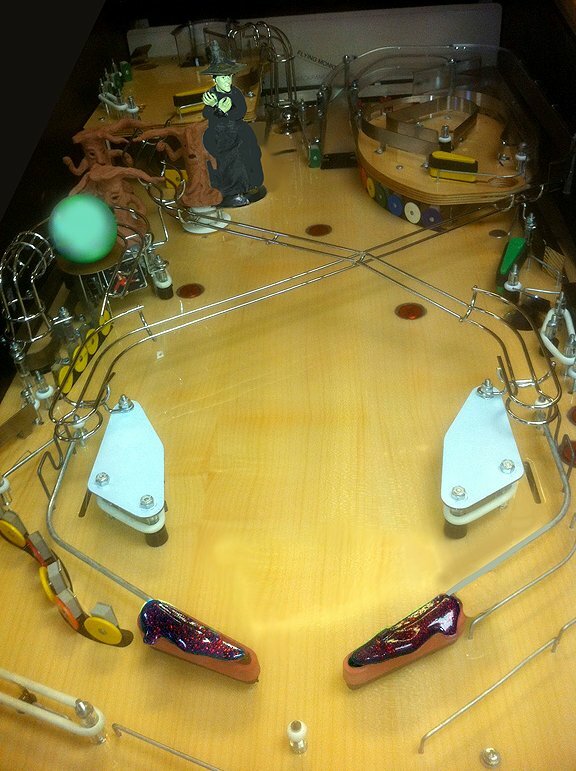 If you’re looking for a full-featured pinball game, this certainly looks like it’s going to do the job. This already looks quite playable despite lacking all of the lights, artwork and remaining toys like the Flying Monkey and the house. End of Process Means Beginning of This Rainbow “This project presented a tremendous opportunity to connect present and past,” said Tony Tasset in a press release provided by Sony. “A rainbow provided a bridge both physically—arching across a section of the lot—and symbolically through its connection to specific films like ‘The Wizard of Oz,’ shot on the lot, and to light itself.” Byers said that neighbors to the studio were initially concerned that the rainbow would light up at night: “It will not be because rainbows are a daytime phenomenon,” Byers said. She added that the design seemed particularly appropriate for the studio lot, which was the former home of MGM.